ROYAUME UNI – Northampton - Preparations for an archaeological dig at a site earmarked for a new railway station are due to begin. The existing Castle Station in Northampton will be replaced by a £20m glass and steel building in 2014. In medieval times a royal castle was situated on part of the site, and last year items from Saxon times were unearthed in an initial trench. The dig will be done by experts from Northamptonshire Archaeology and will take about 12 weeks. 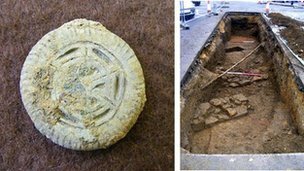 Last October, a 12th Century ironstone wall, pottery fragments and a Saxon brooch were unearthed during a preliminary investigation on the site. During the next two weeks hoarding will be put around the site and it will be prepared for the dig. MYANMAR – Bagan - Burma’s ancient royal capital, Bagan, is home to more than 3,000 temples and shrines - a treasure of archaeology and architectural history. Burma's government wants it recognized as a UNESCO World Heritage Site, but some scholars say that would reward shoddy restorations that have damaged the monuments. 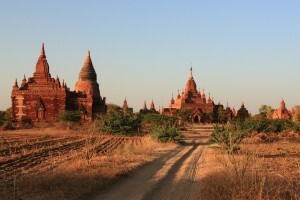 Bagan's millennium-old brick structures are Burma's equivalent of Angkor Wat, the famous ancient stone temple of Cambodia. But while Angkor Wat was professionally restored, experts say the military government damaged Bagan by building on top of old temples or reconstructing them altogether. USA – Hopkinton - National Grid officials are promising a complete archaeological survey of the site of a planned electricity substation in Hopkinton after Narragansett Indian artifacts were found there. Town Council President Frank Landolfi told The Westerly Sun that about half dozen ceremonial stones were found at the site off Route 216. The exact location of the artifacts isn't being disclosed to protect them. EGYPTE – Kom Al-Hittan - Egyptian and European excavators unearthed a collection of black granite statues depicting the ancient Egyptian lioness Goddess Sekhmet during their routine excavation at King Amenhotep III funerary temple in the Kom Al-Hittan area on the west bank of Luxor. The statues depict the goddess Sekhmet in her usual form, sitting on the throne with a human body and lioness's head. "This is not the first time statues of the lioness goddess have been unearthed at Kom Al-Hittan," said Mohamed Ibrahim, minister of state for antiquities adding that the Egyptian-European mission led by German Egyptologist Horig Sourouzian has previously unearthed 64 statues of Sekhment of different shapes and sizes. Ibrahim explained that such a large number highlights the important role of the goddess during the reign of the 18th dynasty king Amenhotep III, father of the monotheistic king Akhnaten and grandfather of the golden king Tutankhamun. Sekhmet was believed to be a protective goddess as she was also the goddess of war and destruction. "Some Egyptologists," pointed out Ibrahim, "believe that king Amenhotep constructed a large number of goddess Sekhmets in an attempt to cure him of a specific disease that he suffered during his reign." Sekhmet was well known of her supposed ability to cure critical deseases. 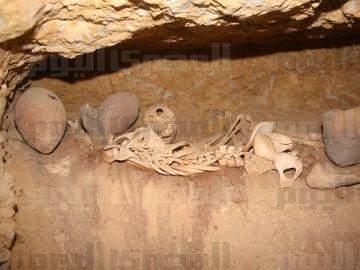 Mansour Boreik, supervisor of Luxor antiquities, told Ahram online that the statues are very well preserved and each one is two metres tall. He continued saying that the newly discovered statues prove Amenhotep III's funerary temple was once filled with Sekhmet statues of different sizes and shapes, similar to his temple on the east bank of Luxor, known as goddess Mut temple. This temple acted as a symbol of stability and prosperity during Amenhotep III's reign. 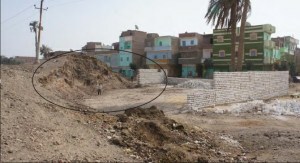 EGYPTE – Antinoupolis - An Egyptian independent archaeologist has warned on Friday that Antinoupolis, one of the country’s largest archaeological sites located in Minya, is being “destroyed systematically” by residents amid a complete failure from the government to protect the site. 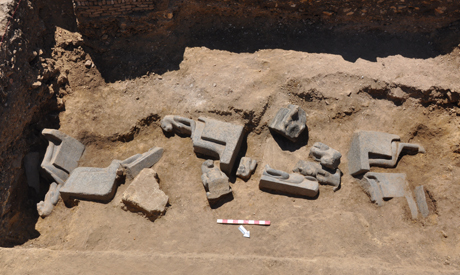 Monica Hanna, a researcher with the University of Humboldt in Berlin, told Egypt Independent that she received information from archaeologists who work at the site of the ancient Roman Antinoupolis, also known as Sheikh Abada, saying the site faces grave danger. Hanna said that some of the damages occurred to the site, saying that the area near the Ramses II temple has been bulldozed and leveled. She added that the northwestern corner of the walled city has been bulldozed and for agricultural use. The case of Antinoupolis was brought to light last December when some media outlets reported that the site was witnessing fierce excavation and demolition campaigns in an attempt to reclaim the land for agricultural use. Some residents reportedly demolished a large area of archaeological ruins and cemeteries made of mud in the Roman cemetery and prepared the area for planting after looting the site.For more information about the damage taking place on the Roman city of Antinoupolis and its necropolis visit Kristian Strutt's site.